“The station could be protecting their image. She could have had a drug overdose, something else…” he pointed out as he took a left turn, as directed by the GPS. “Well, before we get carried away, let’s talk to Jackson.” Sean steered the car into an apartment building parking lot. She’d been working to quiet the voices in her head speculating about how Chloe had died, but speaking with Allison had only ratcheted up their chatter. She needed answers to quell her mind. She also felt a personal obligation to ensure justice was found, probably because she’d known Chloe—even if only for a brief time. Of course, that was assuming she’d been killed. “Yeah, but will you be satisfied if that’s the only question we get answered?” He looked over at her as he held the front door of the building open for her. The glint in his eyes told her he doubted she’d let the matter of Chloe’s death go until she had all the boxes checkmarked and found out what had happened. Sean nodded. Sara often ran with her feelings, her hunches, her higher knowing, and did so on a whim. In contrast, Sean was compelled by reason, logic, and solid evidence. They walked up to Jackson’s apartment on the third floor and knocked. Sean was about to knock again when footsteps padded toward the door. Then all went quiet for a bit. She imagined Jackson looking at them through the peephole. “Jackson?” Sara called out. “It’s the McKinleys.” When he didn’t say anything, she added, “From the haunted house.” Maybe he needed a little more of a reminder. Sean was shaking his head, and if she was reading his mind properly, he was thinking their coming here had been a bad idea. “We’d like to talk to you about Chloe,” she said, certain to articulate in such way that he’d sense concern, not suspicion. The chain rattled as it was being undone, and the handle turned. The door opened slowly. Jackson was standing there in tattered jeans and a T-shirt. His eyes looked weary, and they were wet with unshed tears. Based on his complexion, she guessed that they had interrupted him crying. “She’s dead.” He spat out the words in a cool manner, as if trying to separate reality from emotion, but it only made his pain that much more tangible. 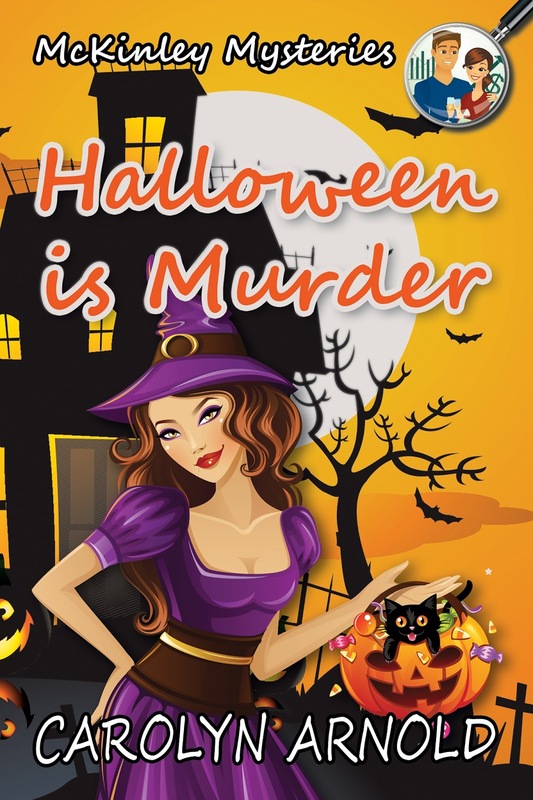 ✯✯✯✯✯An amusing and entertaining mystery! Halloween is Murder is an adventurous entertaining suspense. The beginning is fun and cute and holds enough intrigue that I had to continue to read to find out what was going on. There are several different twists and turns throughout that will keep you guessing until the end. 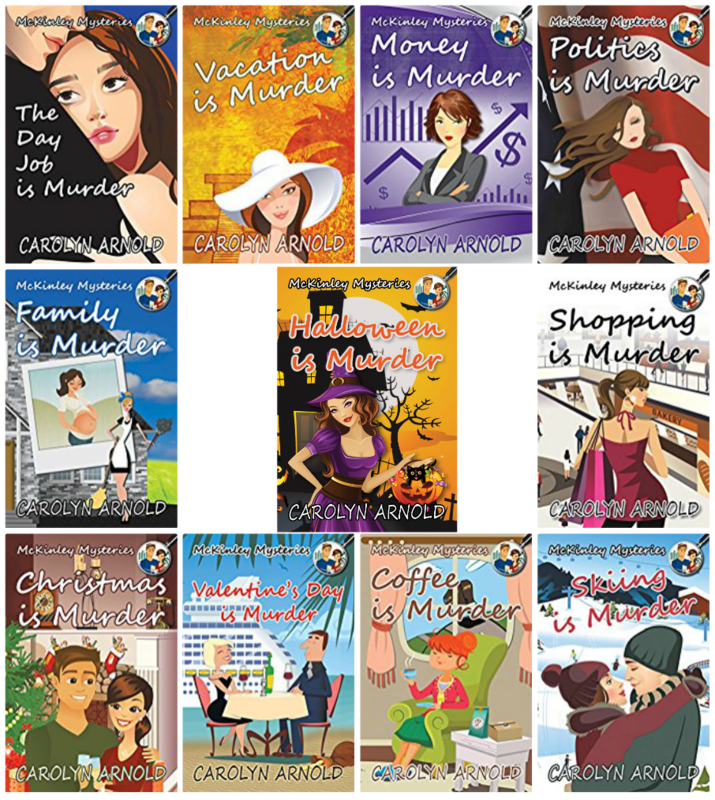 Carolyn Arnold knows how to keep the suspense and intrigue in her stories to keep the reader entertained. Carolyn Arnold has written another captivating and amazing story with characters that are well developed and engaging. Carolyn’s stories are brilliantly written, entertaining, and fascinating. This is a definite winner from this author. I can’t wait to read more in this series and will definitely go back and read the previous books. 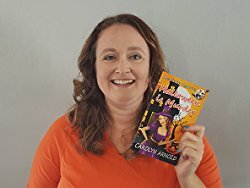 I have read several books by Carolyn Arnold have not been disappointed yet! No matter the seriousness, amusement, or content, Carolyn creates books that will have you engrossed to the very end. I recommend Halloween is Murder to anyone that enjoys an amusing, adventurous and entertaining mystery. Private Investigators Sean and Sara McKinley have rented a house to host a Haunted House for Halloween and have Chloe Parsons, a reporter with Your Source News out to do a feature on it. But when Chloe winds up dead later that day there are questions about how she died. Chloe’s sister, Marie believes that Chloe has been murdered and asks Sean and Sara to take on her case. Will Sara and Sean and their investigators get to the bottom of it and find out what happened to Chloe? This was an interesting story that had you wondering who had it out for Chloe when there seemed to be quite the list of suspects. We don’t get much of Chloe first hand but it appeared that she had her mind set on getting where she wanted to go and wanted things her way. I could definitely understand if she made a couple of enemies from time to time. I think what I found interesting was that Sean, Sara and Jimmy Voight (an investigator with them) seemed to have some resistance by the police so I am not sure what occurred in the past as this was the first book I have read by this author. The ending did surprise me and I liked that. CAROLYN ARNOLD is an international bestselling and award-winning author, as well as a speaker, teacher, and inspirational mentor. She has four continuing fiction series—Detective Madison Knight, Brandon Fisher FBI, McKinley Mysteries, and Matthew Connor Adventures—and has written nearly thirty books. Her genre diversity offers her readers everything from cozy to hard-boiled mysteries, and thrillers to action adventures. She currently lives just west of Toronto with her husband and beagle and is a member of Crime Writers of Canada and Sisters in Crime. Ask anyone who loves Halloween and they’ll probably tell you their favorite part about it is dressing up. When you put on a costume, you can be whomever—or whatever—you want. It’s liberating! On top of that, it’s likely that there are all kinds of goodies lying around the house. When I was a girl, I loved playing Barbie. I loved dressing her up and assigning her whatever life story I wanted. And, man, did I enjoy it! Maybe for a little too long, in fact. I kept playing into my early teens! At the time, I felt like some sort of freak. I certainly wouldn’t have wanted this news to get out to the kids at school. They probably would have called me a baby or something like that. So I kept this part of my life a secret, and I justified my addiction by pinning the blame on my sister, who is six years younger than me—she needed someone to play with! Now that I’m older—much, much older—I look back and find this aspect of my past amusing. I realize that it’s absolutely nothing to be embarrassed about, but it shows me that I’ve always loved telling stories and acting them out. No wonder I became an author! In the grand scheme of things, Halloween is very similar. The holiday allows people of all ages to participate in this fantasy, if only for one night. But as an author, I get to experience Halloween every day of the year. I become someone else every time I sit at my desk and immerse myself into the worlds of my characters. I get to delve into their minds, to know their thoughts, their feelings, their personalities, their lives. And I get to share my imagination with my readers. Now that’s a real treat! Speaking of, I’m going to grab a small bowl of candy corn and gummy peaches and get to writing. Happy Halloween!